Politics have a growing influence on markets since Trump's election. His tweets, even as President-elect, were incendiary. Since coming into office, it wasn't just his tweets but also his deeds in three fields. All impact the economy, thus impacting the Fed's decisions and the US Dollar. Trump's tariffs on China have hurt the global economy and sent the US Dollar higher. If the House is controlled by Democrats, they could limit his ability to slap tariffs. On the other hand, they could also block any trade deals. The new NAFTA accord, called USMCA, needs approval by Congress. All in all, Democrats are more trade-friendly in the era of Trump than Republicans that were traditionally more pro-trade. Many assume that part of Trump's tough stance on trade stems from political reasons: to fulfill elections promises to convince his supporters to get out and vote. And after the elections, he may ease the pressure and revert to a more pro-trade stance. In this case, it does not matter who wins. It is important to remember that Trump is unpredictable. If Democrats win the lower chamber, any new major legislation will be blocked, but Trump's nominations will still be approved by the Senate. The parties could find a way to compromise and get laws passed in both chambers. The current political climate does not suggest compromises, but with each party controlling a different chamber and a desire by voters to see a less-toxic scene, anything can happen. In case of a considerable "blue wave," Democrats will unseat Texas Senator Ted Cruz, win Jeff Flake's open seat in Arizona, and win other places without having incumbents losing. Congress was entirely controlled by Republicans in Obama's last two years, halting any new legislation. Democrats would have their opportunity for payback, making life miserable for Trump. There is always a chance they will find a way to work with Trump on a few issues that they can agree on. However, they will be emboldened by the party activists to strike a tougher tone against the President. In the more likely case that the Democrats win the House, the US Dollar will likely drop, but as this scenario is mostly priced, the reaction will be relatively muted. 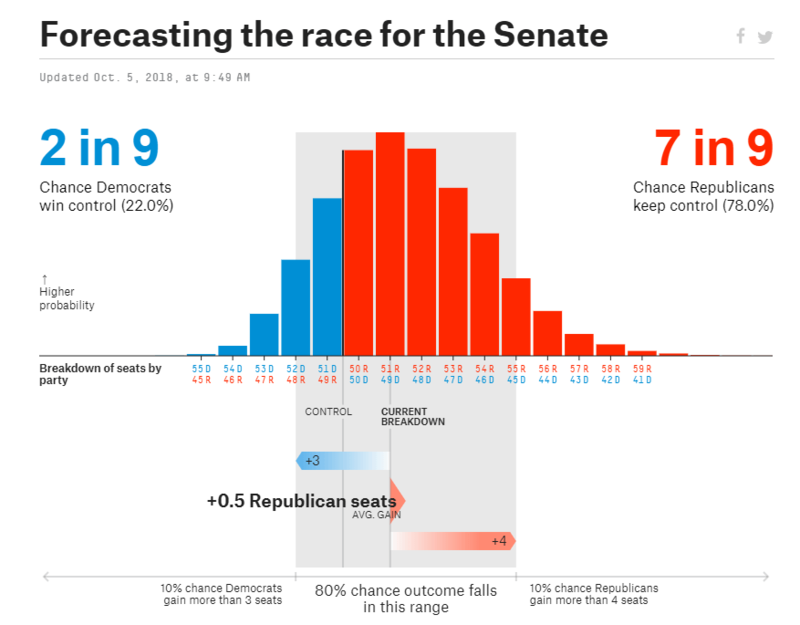 If the Dems also take the Senate, the Dollar's fall could be quite substantial. Brexit remains the central theme for the British Pound. If a Brexit deal is struck before the mid-terms, Sterling will weather any Dollar storm resulting in a Republican achievement and will beat its peers if Democrats win. However, if the chances for a "Hard Brexit" rise, Sterling may be unable to capitalize on a Democrat win and will tumble on a Republican one. The Japanese Yen is a safe-haven currency that attracts flows on bad news. If Democrats win the House, the greenback will fall across the board, and the Yen is unlikely to stand out from the crowd. But if Democrats also win the Senate, the Dollar may find it hard to beat the Japanese currency as concerns about an immediate halt to Trump's expansionary policies may send month to the safety of the Yen. Commodity currencies and especially the Australian Dollar are more sensitive to trade wars. The AUD/USD could be the biggest loser if Republicans retain control and go after China., Australia's No. 1 trading partner. The results will be known on November 7th, but the new Congress will only convene in early January. These two months are known as the "lame duck" period in which outgoing lawmakers will have their last chance to impact the country. If Republicans lose the House, they may try to pass some last-minute decisions. Their chances may be slim due to the slow procedures. However, they may work hard into the holiday season, promising more volatility even during the quiet Christmas period. If they retain control, they may begin working on Tax Cuts 2.0. 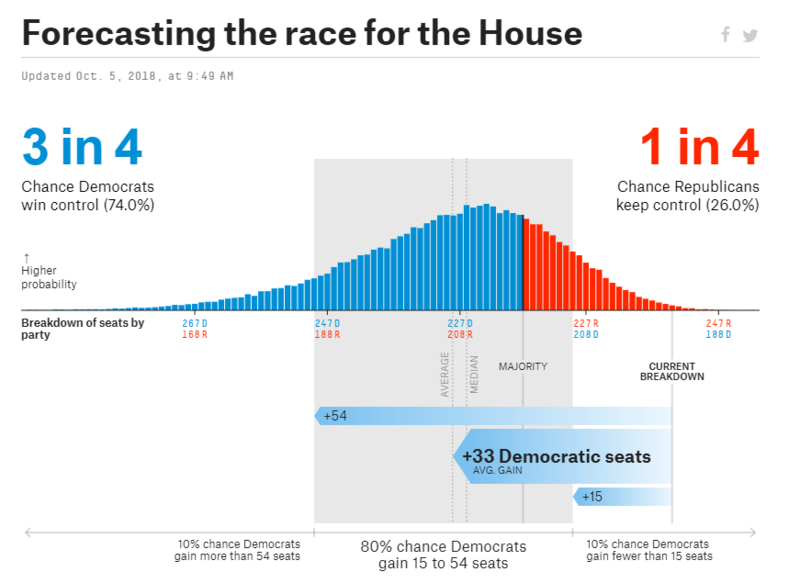 If Democrats win the House or even the Senate, volatility could be higher as the level of uncertainty about Democrats' plan will be higher. The fight with Trump and the Republicans will impact currencies especially when it comes to taxes. If Democrats manage to block Trump on trade, it could be a relief for markets and weigh on the US Dollar. What Democrats could do is initiate investigations into Trump's various business dealings, conflicts of interest, ties with Russian oligarchs, favors he received in China, and other endless affairs. They can exhaust the White Hosue and derail tax cuts, thus impacting markets. Another potential scenario is that the Mueller investigation concludes the Trump colluded with the Russians. Democrats will immediately call for his ousting. Republicans will probably wait for opinion polls. If Trump not only cost them many House seats but also threatens to bring them down in 2020, they may join Democrats. If Trump's base remains strong, Republicans will likely defend their standard-bearer. Another option for Trump's ousting is by the 25th Amendment, a procedure never undertaken in American history. In this scenario, Vice President Mike Prence would lead the cabinet to oust Trump on the grounds that the President is unfit. Pence is an ultra-conservative that believes in free markets more than Trump, and that is less likely to fight trade wars. He is aligned with other Republicans' desires for tax cuts.